Download "MERIT SYSTEM SERVICES Date Established: 01/22/76 Date Revised: 07/01/03 11/07/07 01/17/14"
3 Social Wker IV page 3 of 5 Association of Social Wkers (NASW) Code of Ethics. Perfms related duties as assigned. EMPLOYMENT STANDARDS Knowledge of: Principles and practices of ganization, wkload management, and time management. Principles and practices of note taking, rept writing, English composition, grammar, punctuation, and spelling. Phone etiquette and interview techniques. Principles and practices of counseling, bio-psychosocial assessments and therapy Physical and mental health principles and the impact on the personality. Local socio-economic conditions, trends, and current problems and methodology in the field of public social services. Basic principles and techniques of interviewing and recding the social casewk. Laws, rules, and regulations governing the operation of the public welfare agency and the role and responsibilities of a social wker. Community ganizations and social problems calling f the use of public and private community resources. Basic principles involved in the nature, growth and development of personality, and in-group processes. Basic principles of individual and group behavi. Current issues in the field of social welfare. Principles of analysis and problem-solving methodology. Basic public welfare programs on the Federal, State, and local level. General principles of public assistance policies and programs. Medical, legal, economic, and social management needs of individuals and families with special medical needs such as HIV disease, drug dependency, the medically fragile child, Alzheimer s, and the terminally ill. Strategies and protocols surrounding crisis intervention techniques such as voice modulation and assessing the potential f suicide. Psychopathology, the different types of mental illness diagnoses, how mental illness affects human behavi and mental health services and treatments utilized by clients. Signs, stages and dynamics of abuse, and the effects of abuse on child/adult development and behavi. Signs and symptoms of alcohol and drug use/abuse in adults and children and the effects on families. Standards f maintaining clients safely in home; options f placement; effects of removing clients from unsafe situations. 4 Social Wker IV page 4 of 5 Ability to: Apply the principles of child psychology and family relationships. 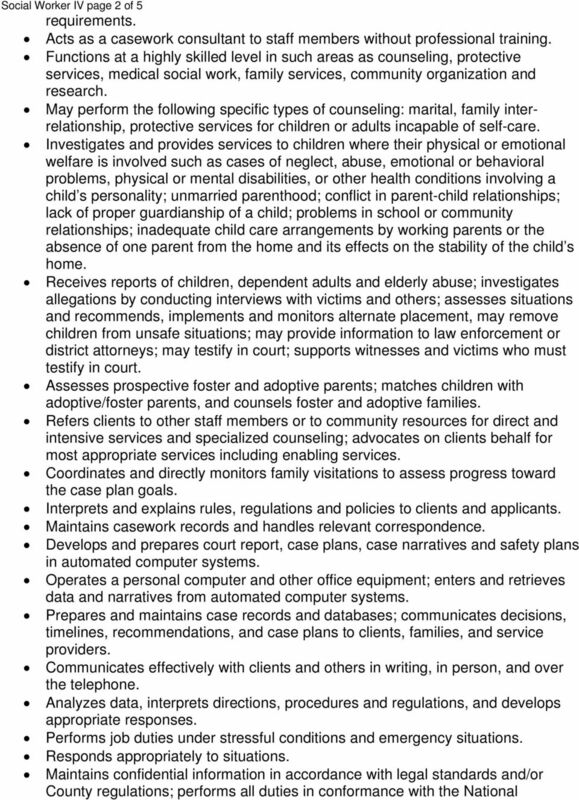 Evaluate personal psychological facts in the child and/ family s situation. Recognize signs of abuse f children, the elderly and dependent adults; assess risk facts and potential dangers to clients. Act effectively in stressful situations. Demonstrate skill in the me difficult casewk areas. Accept and use consultative supervision. Analyze situations and adopt effective courses of action. Apply existing laws, rules and regulations to welfare department operations and interpret and explain to the applicant, recipient, others public social services programs, policies, rules and regulations. Develop skill in interviewing, case recding and interpretation. Interact professionally and respectfully with clients including difficult, hostile, distressed clients. Respect cultural differences. Wk constructively within a community setting and effectively use appropriate resources and services. Understand and learn the agency programs, policy and procedures. Obtain and recognize relevant and significant facts. Organize and maintain wk detail. Relate and wk well with agency staff, clients, and others. Communicate effectively, both ally and in writing. Establish and maintain client rappt on an individual basis. Maintain confidentiality in accdance with legal standards and/ county regulations. Use computers and related software. Establish and maintain cooperative wking relationships with agency staff, clients, and outside ganizations. 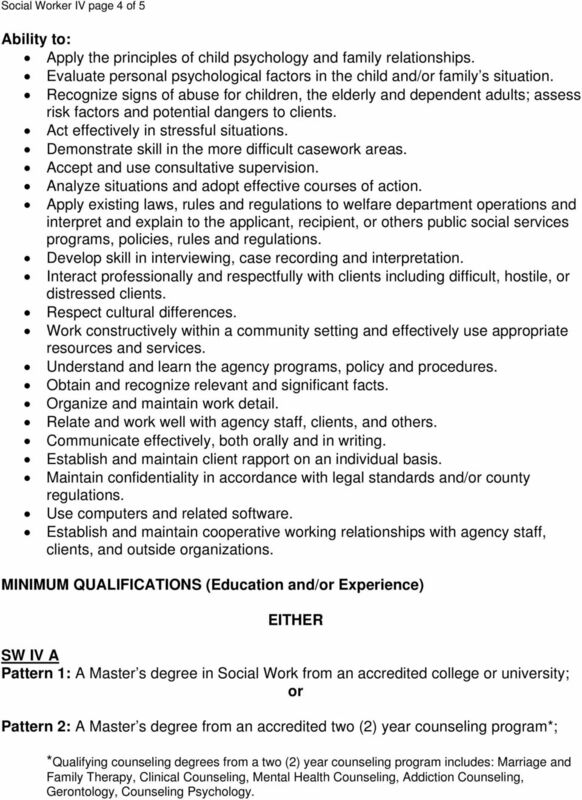 MINIMUM QUALIFICATIONS (Education and/ Experience) EITHER SW IV A Pattern 1: A Master s degree in Social Wk from an accredited college university; Pattern 2: A Master s degree from an accredited two (2) year counseling program*; *Qualifying counseling degrees from a two (2) year counseling program includes: Marriage and Family Therapy, Clinical Counseling, Mental Health Counseling, Addiction Counseling, Gerontology, Counseling Psychology. 5 Social Wker IV page 3 of 5 Pattern 3: One (1) year of full-time experience perfming advanced journey (equivalent to a MSS SW III) level social wk case management as a Social Wker in a public private agency and Master s degree in social behavial science, psychology, anthropology, sociology and counseling education SW IV B (This level is f candidates with a Master s degree and experience. Experience during an internship does not count at this level). Pattern 1: A Master s degree in Social Wk from an accredited college university and one (1) year of full-time experience perfming social wk case management as a Social Wker in a public private agency; Pattern 2: A Master s degree from an accredited two (2) year counseling program* and one (1) year of full-time experience perfming social wk case management as a Social Wker in a public private agency; *Qualifying counseling degrees from a two (2) year counseling program includes: Marriage and Family Therapy, Clinical Counseling, Mental Health Counseling, Addiction Counseling, Gerontology, Counseling Psychology. 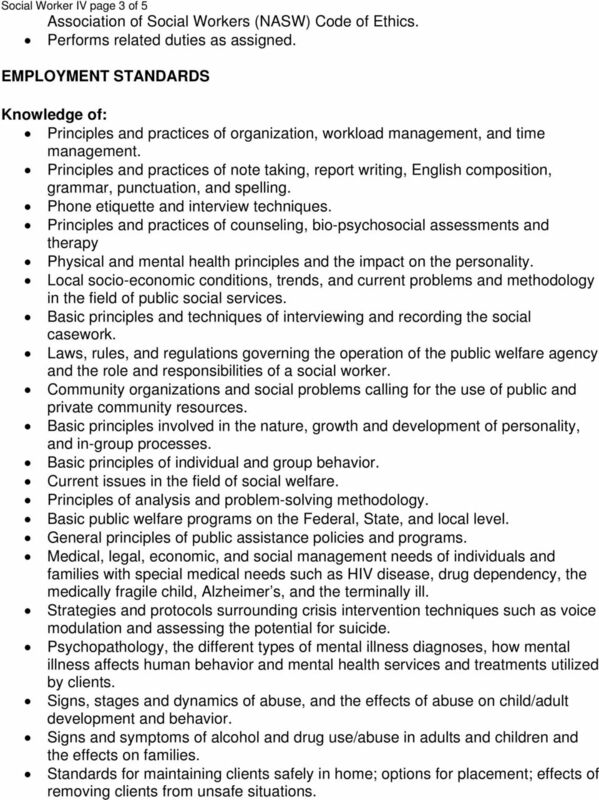 Pattern 3: Two (2) year of full-time experience perfming advanced journey (equivalent to a MSS SW III) level social wk case management as a Social Wker in a public private agency and Master s degree in social behavial science, psychology, anthropology, sociology and counseling education. SPECIAL REQUIREMENT Some positions may require possession of special language and culture skills as a bona fide qualifications standard. In these cases, candidates must demonstrate that they possess the required skills. DRIVER LICENSE REQUIREMENT Some positions in this classification may require possession of a valid Califnia driver s License. Employees who drive on County business to carry out job-related duties must possess a valid Califnia driver s license f the class of vehicle driven and meet automobile insurability requirements of the County. Eligibility f employment f those who do not meet this requirement due to disability will be reviewed on a case-by-case basis by the appointing authity. 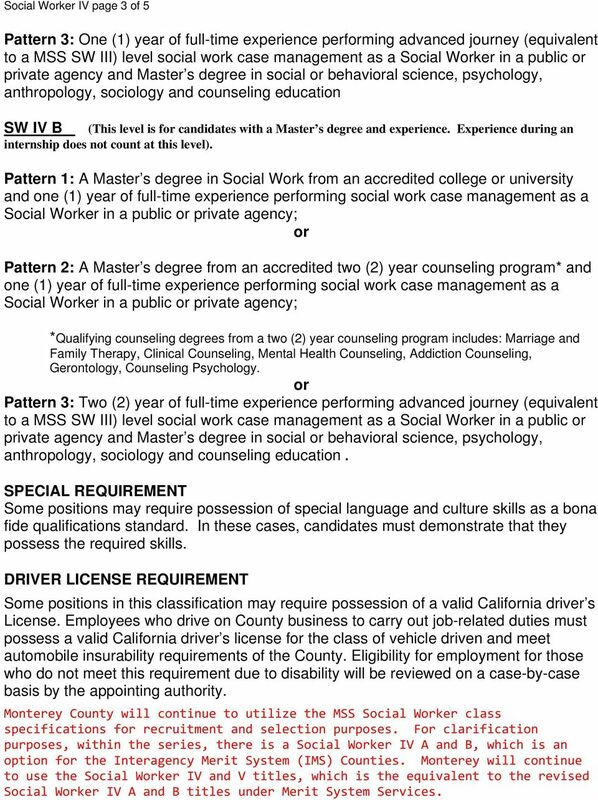 Monterey County will continue to utilize the MSS Social Wker class specifications f recruitment and selection purposes. 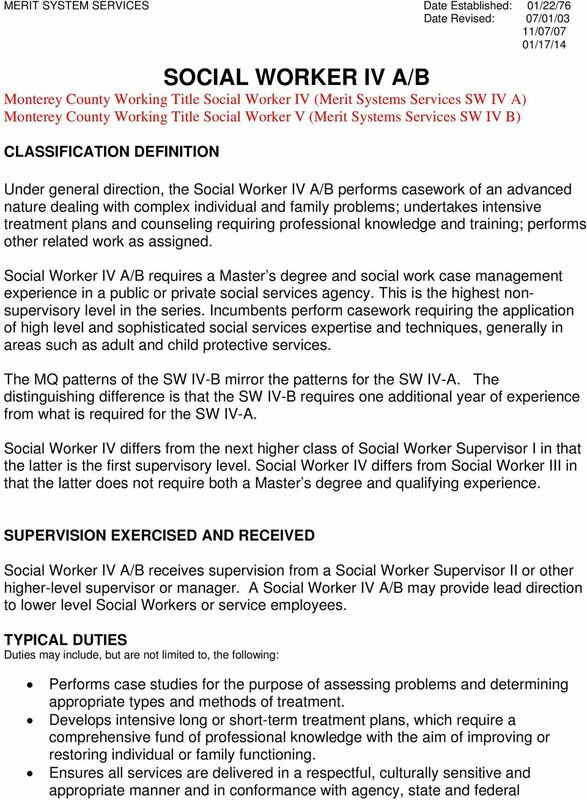 F clarification purposes, within the series, there is a Social Wker IV A and B, which is an option f the Interagency Merit System (IMS) Counties. Monterey will continue to use the Social Wker IV and V titles, which is the equivalent to the revised Social Wker IV A and B titles under Merit System Services. Determines database requirements and prepares database design for highly complex systems. SENIOR APPLICATIONS DEVELOPER ERP Solutions Specialists DEFINITION: This is highly advanced technical supervisy wk in the analysis, planning, design, programming, and maintenance of computer applications. The School Social Worker reports to the Principal.